Looking to arrive to William Creek in style? Check out our flight transfer options. The Closest Town to Kati Thanda-Lake Eyre North! The William Creek Hotel is located in the smallest town in Australia, William Creek, on the iconic Oodnadatta Track, halfway between Coober Pedy and Marree in Outback South Australia. The town of William Creek sits in the centre of the world’s largest cattle station, Anna Creek Station. William Creek is your ideal overnight stop - with delicious Outback pub fare, icy cold drinks and an authentic Outback experience. 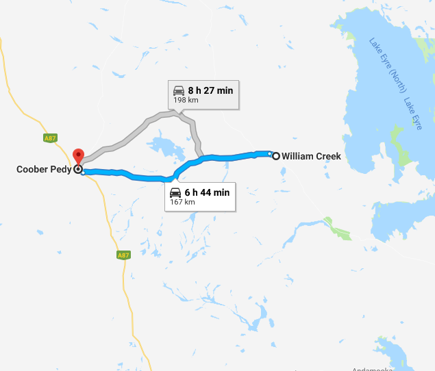 The William Creek Hotel is accessible by unsealed road from Coober Pedy, Roxby Downs, Marree, Oodnadatta and Birdsville. Incorporate William Creek as part of your Outback adventure. Check road conditions at the DPTI website. William Creek is about a 2-hour drive east of Coober Pedy, and is located on the well known Oodnadatta Track. NOTE: Google Maps has indicated 6 hours 44 mins driving time but this is actually INCORRECT! From Port Augusta travel to Marree and on to William Creek. This is a very scenic route, travelling through the spectacular Ikara-Flinders Ranges and past majestic Wilpena Pound. Roads are sealed until Maree. NOTE: Google Maps has indicated 15 hrs 8 mins driving time but this is actually INCORRECT! From Port Augusta. 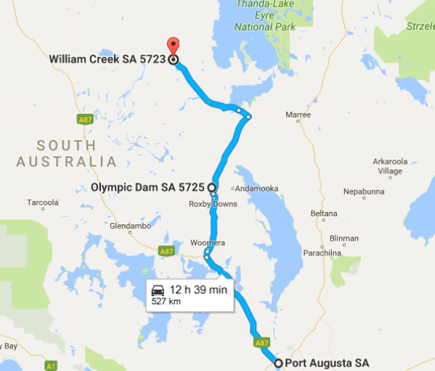 travel to Woomera and turn off in the direction of Olympic Dam. Turn left at the Oodnadatta Track and travel to William Creek. 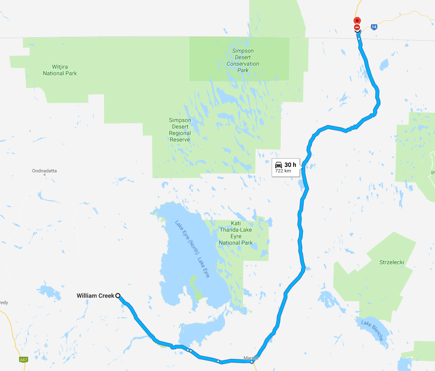 Travel time approx 8 hours. NOTE: Google Maps has indicated 12 hrs 39 mins driving time but this is actually INCORRECT! Many outback adventurers come to William Creek via Birdsville in Queensland, or via Cameron's Corner at the junction of the borders of Queensland, South Australia and New South Wales. The Outback Loop Touring Guide Map is a good planning guide (also available from the Wilpena Pound Visitor Information Centre). Good trip and vehicle preparation are recommended whether you choose to travel the Birdsville or Strzelecki Track. Download the Remote Area Travel Information brochure. 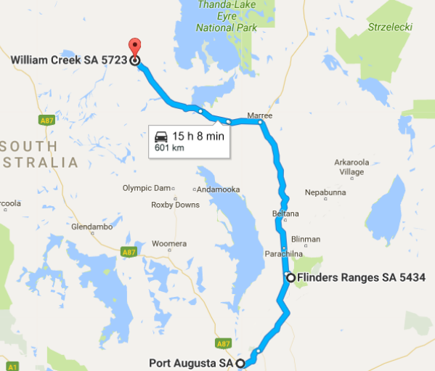 There are several suggested itineraries for visiting William Creek including the Outback Loop® and Explorers Way. The Outback Loop® is a travel itinerary which incorporates three iconic Outback tracks - Birdsville, Strzelecki and Oodnadatta. Download your map or request a printed copy to plan your travels. The Explorers Way is a travel itinerary incorporating the Flinders Ranges and Outback South Australia. Download your map to plan your travels. Arrive into William Creek in style by a scenic air transfer with Wrightsair. 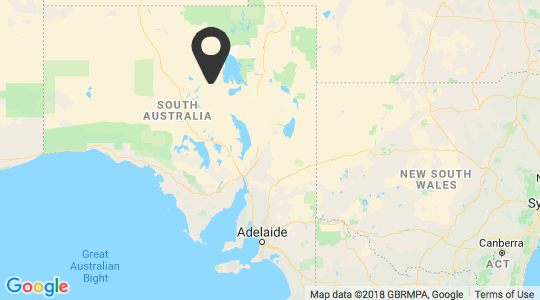 Wrightsair can connect with scheduled air services arriving into Coober Pedy, Olympic Dam, Port Augusta, Adelaide, Alice Springs, Uluru (Ayers Rock) and other locations. Alliance Airlines flies into Olympic Dam daily with up to four services per day. They also fly into Moomba, Alice Springs and Uluru (Ayers Rock). REX (Regional Express) operates scheduled flights into Coober Pedy with up to five services per week. They also fly into Port Augusta, Whyalla and Birdsville. Qantas and Virgin Australia operate regular services into Alice Springs, and Jetstar and Virgin Australia operate flights into Ayers Rock (Uluru). We can also pick up from other airstrips around South Australia including Marree, Wilpena Pound and many others. Flying into William Creek in your own aircraft? Find out more HERE. Check out what's going on!